and is owned by the National Trust. The plaque commemorates one man. and is buried at Etaples Military Cemetery, France. 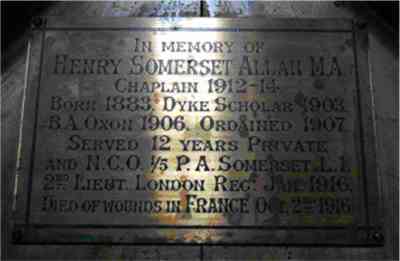 Lieutenant Allan is also commemorated on the Memorial in Broadclyst Church. Territorial Efficiency Medal. Son of the Rev. George Alexander Allan and Henrietta Allan. Born at Puckington Rectory, Somerset. M.A., Oxford. Late Chaplain of the Holy Evangelists, Killerton Park, Devon. Served 12 years in the ranks, viz. : four in the Oxford U.R.V.C., and seven in the 5th Battalion, Somerset Light Infantry at home and in India.